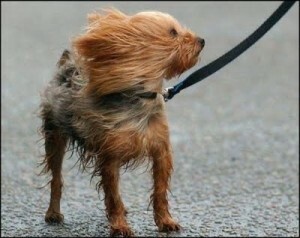 Why do the winds pick up right before a thunderstorm? Long-lived thunderstorms have a typical structure which is created when warm and humid air rises and condenses as it cools, causing rain. As this rain falls, it may evaporate and lead to cooling behind the storm, creating storm outflow. This outflow spreads out as it hits the ground and helps lift the warm humid air feeding the storm. Often, an observer in the path of the storm will first feel the warm humid air well ahead of the storm, and then the cool wedge of air from the storm outflow before finally experiencing the rain associated with the storm itself. Temperature inversions form in the atmosphere whenever the air temperature increases with . They can form in the summer in valleys or even shallow depressions as cool air flows downward and accumulates in the low spots. They may also form in the winter after a storm as the very strong cooling of a snow covered surface at night causes relatively cold temperatures near the surface. 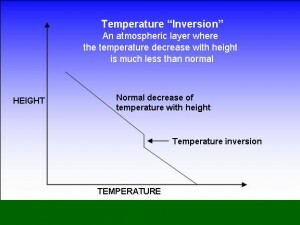 Inversions act as a lid on upward motion, creating stable and static conditions while they exist. What is the difference between a typhoon and hurricane? A hurricane is a low pressure system of tropical origin containing organized thunderstorm activity that produces sustained winds of at least 74 mph. Guess what? A typhoon is the same thing! Let me repeat; a hurricane and a typhoon are the same. From a meteorology perspective, there is absolutely NO DIFFERENCE between a typhoon and a hurricane (and for that matter there is no difference among a hurricane, typhoon, tropical cyclone or severe cyclonic storm). So why the different names? It all has to do with what ocean basin the storm resides in. 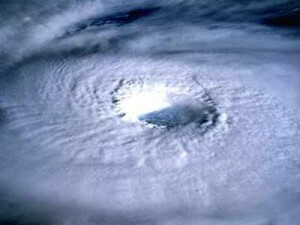 Hurricanes are known by different names in various regions of the world. Hurricanes are in the Atlantic ocean or eastern Pacific Ocean. A typhoon is the same type of storm only in the western Pacific. Read the rest of the article by clicking on the photo below. Greetings everyone! We’ve been hard at work implementing the latest set of feature and enhancement requests we’ve received from you, and today we are proud to announce the release of HailStrike’s hail tracker app, online version 4.0! This represents a fairly major update in the user interface, so in addition to all the new features, we have also included an in-depth, interactive tour that you can take at your discretion, as many times as needed, to get the most from the tools. You will see a big orange “Take The App Tour” button at the top of the screen when you login to the app. Brand new simplified search. When you open the app, you will be presented with a brand new search interface on the left hand panel. Type in any city, state, or even street address to get the latest available listing of storms. 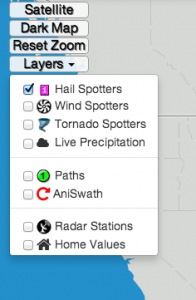 This features the same power as the hail locator we recently released on the main website, but is much more configurable. 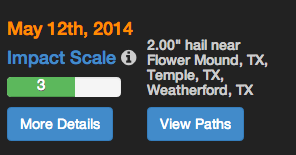 You can filter results by date range, minimum hail size, and distance from the entered address. Within the search results is our new(ish) impact rating for each storm. Click on more details to get a comprehensive listing of factors that can help you determine if a storm is worth your while. 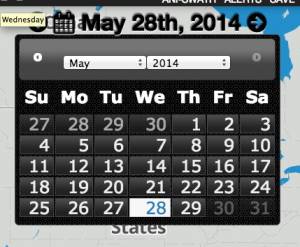 The date picker is now located in the top middle of the app. You can change the date by clicking it, or use the arrows to move forward or backward a day at a time. 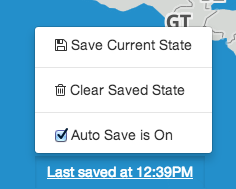 The app now saves your preferences automatically every 2 minutes, or on command. Now, when you search in an area, toggle your map layers on/off, or load a particular storm, the app remembers and will load up the same settings the next time you log in! There are several new layers you can overlay on the map, including a Live Precipitation layer and a Home Values layer. Now you can see average values of homes in neighborhoods across the U.S. underneath your paths and swaths! 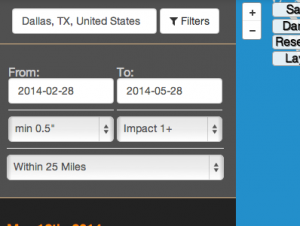 We’ve increased the default search radius circle to 50 miles, and upped the 2x to 125 miles. We’ve beefed up our servers to handle the extra data. In addition to satellite mode, you can now use the dark map mode, which gives excellent contrast for AniSwath maps. Get the street level address at the point you clicked. Center the map on that point. Show paths for that area. Locate businesses for that area. You can specify body shops, roofing supply, or anything else, and we’ll pull up nearby matching business listings. There were several other small tweaks and fixes that some of you will notice, but no need to bog down our post with them now. We hope you enjoy this new release. As always, if you have feedback or further feature requests, don’t hesitate to comment or shoot us an email. HailStrike is recommended by Todd Legal, P.A., in this blog post for Florida homeowners insurance claims, as an easy way to avoid costly mistakes. Todd mentions using HailStrike’s online tools to verify a claim from a roofer, insurance agent, or homeowner.